Niagara's Watercooler: Who Loves An Adventure in Books? Who Loves An Adventure in Books? 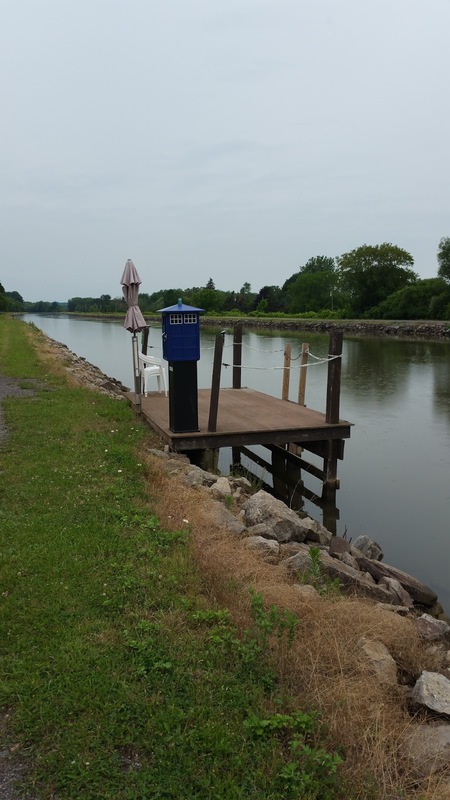 If you’re walking down the towpath on the south side of the Erie Canal near Day Road, you may stumble upon a bit of a surprise. 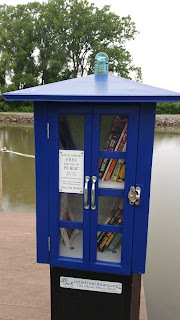 Situated at the edge of a dock anchored to the rocks along the shore of the waterway is a TARDIS. While you won’t see the Doctor jumping out from its doors, it can take you away to another world. Author Cynthia Cotten and her husband, Steve, constructed a miniature version of the TARDIS of Doctor Who fame. In it, they house a small library of books, free for the public to use. Several years ago, the Cotten’s children gave them a charter for a little free library. There are books available to send you on a journey to another world. The Little Free Library is an organization formed to inspire a love of reading, build community, and spark creativity by fostering neighborhood libraries around the world. They are in over seventy countries with over 50,000 libraries distributing millions of books each year. For more information, please visit littlefreelibrary.org. On the website, there is a map that shows where the other libraries in the area are located. According to that site, there are three in the Lockport area. Aside from the Cotten’s on Day Road, there is one located on Ambleside Drive that is run by a 9-year-old girl. The other is on Outwater Drive and is sponsored by the Anna Merritt PTA. In 2013, Cotten published a children’s book, The Book Boat’s In. The book is based on a 19th-century boat that traveled on the Erie Canal, bringing books to the communities along the waterway. In a simple twist of fate, Cynthia Cotten has brought her book to life with her library on the banks of the Erie Canal. If you’re out on the canal for a walk, try the south side towpath and take a trip through time and space with a good book. They’re there, just waiting for the next person to take an adventure with them. You can’t miss it. It’s a blue police box. Craig Bacon is going to check out the TARDIS on the banks of the Erie Canal. He’s currently looking for a companion to join him on that adventure.